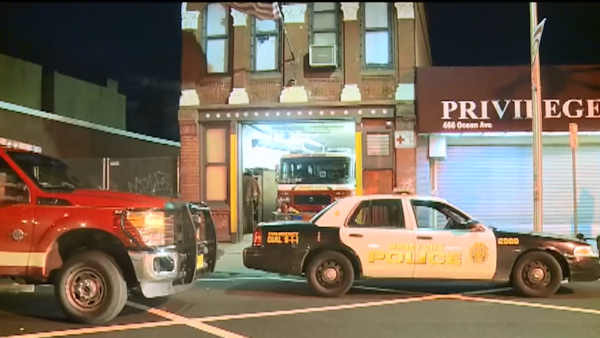 JERSEY CITY, New Jersey (WABC) -- A suspect is under arrest in the burglary of a Jersey City firehouse while the firefighters were battling a nearby blaze. 29-year-old Antwan Barfield of Van Nostrand Avenue in Jersey City was identified by police after they say he used one of the firefighters credit cards hours after the theft. Barfield is charged with theft and burglary. At least some of the stolen property was recovered. The firefighters found a broken window and their valuables missing after they returned from the scene of a house fire late Thursday night. The men were battling a blaze in a six-apartment building on Cator Avenue and rescued a 16-year-old boy who was trapped on the third floor. The theft involved wallets, cash, credit cards, laptops and tablets.